A legend in its own considerable lifetime, the family-run Bar Italia in Soho is the closest London gets to a typical, Italian espresso bar, which is probably why I like it so much. The espresso alone is reason enough to come here. It is, for me, pretty much perfect. Strong, very short, smooth and with just a hint of bitterness in the after taste: I really can’t imagine improving on it in any way. The only problem is that while Soho is a great place, I’ve never had a particular reason to go there. It’s not on my way to anywhere or near anywhere I regularly visit. So, while I’ve been a visitor to Bar Italia for at least 10 years, I didn’t used to go there that often. However, for the last couple of years, I’ve taken to coming here specifically to treat myself, just for the love of the coffee. Really, I can’t give it any higher recommendation than that. I think I first came across Bar Italia through an entry in Lonely Planet’s London Guide. At the time, more than 10 years ago, I was trying to approach London as I would any city that I was visiting while on holiday, rather than as a nasty, noisy, busy place that I went to when I had to for work and then got out of as quickly as possible. I can distinctly remember visiting Bar Italia back then and while I remember liking it, I didn’t appreciate it as much as I do now. In fairness, I wasn’t as passionate about my coffee back then. Passionate, yes, but not that passionate. So, the years went by and if I was in Soho, I would call in at Bar Italia, but I doubt if I visited it more than once a year. Then, about five years ago, I made another concerted (and this time more successful) effort to try to see London as a place to visit and enjoy, rather than somewhere to get in and out of as quickly as I could. And, slowly but surely, my love affair with Bar Italia grew. As I’ve said, the espresso alone is reason enough to come here. But there’s more to it than just the coffee. There’s also a great range of cakes and other sweet things. Bar Italia has the usual coffee-shop offerings of Danish pastries and muffins, but I’ve never tried any of them. Really, what’s the point? For, under the counter, the more discerning customer will find Bar Italia’s Italian treats, including cannoli, cheesecake, lemon tarts, custard tarts and, my own personal favourite, the Torta Della Nonna. They’re all good though and I should know: I’ve tried them all over the years! There’s also the ambience. Personally, I’ve never liked sitting outside due to the street noise, but it seems popular enough out there, especially on a sunny day. However, my haunt is inside, on one of the bar stools at the back. It’s not a place to linger too long (I give it about 20 minutes before my back starts playing up). Still, this is in keeping with the place; espresso is a short drink, not to be lingered over for too long. The one thing Bar Italia lacks is a proper stand-up bar, but that’s probably going too Italian for London. That said, before now I have turned up, ordered my espresso, drunk it there and then and walked out again, which got me a nod of approval. Inside, Bar Italia has the feel of 1950s London (at least, what I imagine to be the feel of 1950s London: I’m not that old!). It still has an old-fashioned hand-pumped espresso machine, which I’d love to have a go on, and a very old-fashioned mechanical till (for those who remember “Open All Hours”, it makes even Arkwright’s till look modern). I’ve no idea what it’s like to use, but it’s a joy to look at. In closing, I should say that while Bar Italia is not the cheapest espresso in London, you very definitely get your money’s worth. Besides, three generations of Londoners can’t be wrong, can they? 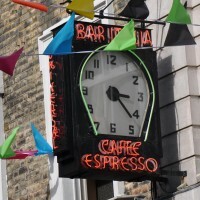 This entry was posted in Cafes, Cake, Coffee Terraces, Evening Opening, Late Opening, Sandwiches, West London and tagged include by Brian Williams. Bookmark the permalink. They look great! I going to London soon so I might try to find this one!